An absorbing, revelatory, and definitive account of one of the greatest tragedies in human history Adroitly blending narrative, description, and analysis, Richard J. Evans portrays a society rushing headlong to self-destruction and taking much of Europe with it. Interweaving a broad narrative of the war's progress from a wide range of people, Evans reveals the dynamics of a society plunged into war at every level. 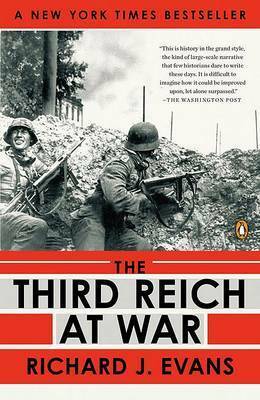 The great battles and events of the conflict are here, but just as telling is Evans's re- creation of the daily experience of ordinary Germans in wartime. At the center of the book is the Nazi extermi-nation of the Jews. The final book in Richard J. Evan's three-volume history of Hitler's Germany, hailed "a masterpiece" by The New York Times, The Third Reich at War lays bare the most momentous and tragic years of the Nazi regime. Richard J. Evans was born in London and educated at Oxford University. He has taught at Columbia University and Birkbeck, University of London, and since 2014 has been the Regius Professor Emeritus of History at the University of Cambridge. His many publications include an acclaimed three-volume history of the Third Reich and a recent collection of essays, The Third Reich in History and Memory. A Fellow of the British Academy and the Royal Society of Literature, he is a past winner of the Wolfson History Prize, and was twice a History Honoree at the Los Angeles Times Book Awards. In 2012 he was appointed Knight Bachelor in the Queen's birthday honors list, for services to scholarship.